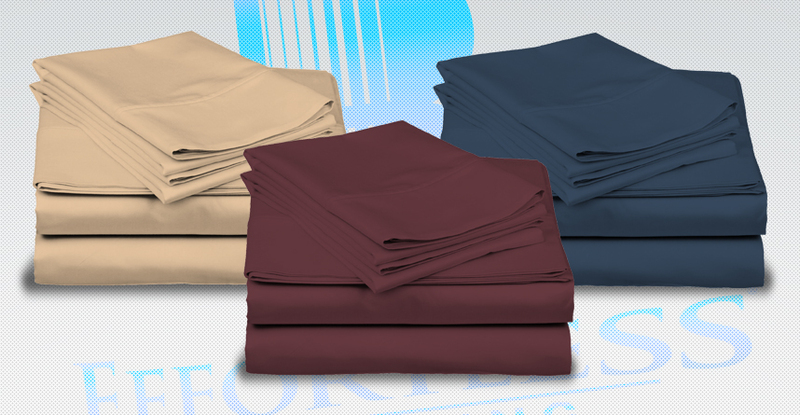 MicroFiber | Effortless® Sheets Official Site | The world’s first top sheet that’s fitted at the bottom. Featuring the World’s first patented semi-fitted top sheet, that’s fitted at the bottom seamlessly! The patented semi-fitted top sheet is seamlessly contoured and elasticized at the foot end, gently hugging your mattress. Making your bed is as easy as 1-2-3! Dress your bed in Effortless® Bedding 1800 series Egyptian comfort luxury microfiber fabric, at 98 GSM for a soft and silky smoot feel. Our Hypo-allergenic and wrinkle resistant, no iron, material is easy to care for and we know you will absolutely love it! The micro yarn fabric is so soft, yet durable and so comfortable, that you'll never want to sleep anywhere else. Compliment your bedroom with 10 available beautiful colors. Effortless® Bedding sheet dimensions are oversized with fully enclosed elastic hems and extra deep pockets on the fitted sheet and a 4-inch hem on the Patented semi-fitted top sheet and pillowcases. (1) Patented Semi-Fitted Top Sheet, (1) Fitted Bottom Sheet & 2 Pillow cases. (1) Patented semi-fitted top sheet W-68” x L-98” (1) Fitted sheet W-39” x L-75” X D-16”, (2) pillowcases 20" x 30"